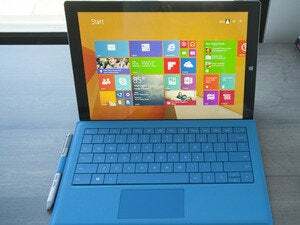 Microsoft sparked a race to the bottom with the introduction of Windows 8.1 with Bing. And Toshiba cut the bottom out of the bottom line with its Encore 2 series, bringing Windows tablets down to the price of mainstream Android tablets. The 10-inch version reviewed here will set you back just $270, and the smaller 8-inch version costs just $200. What compromises must you put up with at prices that low? Surprisingly few. While the Encore 2’s build quality isn’t the best, the tablet is sturdy enough that I wouldn't worry about sliding it into a bag and carrying it around all day. The tablet feels plasticky, but it’s also light at just 1.2 pounds. And since that weight is in a slab that's only 0.375 inches thick, it feels solid. I was able to hold it comfortably in one hand for extended periods, and that’s something I can’t usually say about 10-inch tablets. I prefer the real button to the touch-sensitive version on the previous Encore. The white bezel and champagne back help the Encore 2 stand out in a market full of black and silver. Its IPS panel delivers run-of-the-mill resolution of 1280x800 pixels, but it boasts good viewing angles. It gets dim enough to be comfortable in dark environments, but you'll want to crank it all the way up to work in a well-lit room. Most of the Toshiba Encore 2's ports are located on its right-hand side: You can use its MicroSD card slot to add up to 128GB of storage. I did encounter some intermittent responsiveness issues with the touchscreen, though. A firmware update improved the situation, but it never entirely disappeared and I was never able to isolate the cause. A quick reboot generally smoothed things out when it became too annoying. 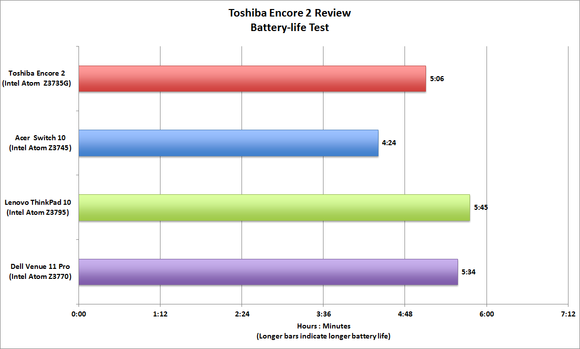 The Encore 2's battery life is respectable for a 10-inch tablet. There’s a small Toshiba logo on the tablet’s front bezel, but the capacitive Start button on the previous-generation Encore has been replaced by a physical button on the top edge. You’ll also find a volume rocker and a power button here. I actually prefer the real button to the touch-sensitive version, as I was less likely to activate it by mistake. Stereo speakers on each side work well for videos and music playback in a quiet room, and there’s a headset jack for private listening and video calls. A microSD slot lets you expand the Encore 2’s measly 32GB of storage, and you’ll find micro HDMI, and micro USB ports on the same edge. Wireless connectivity includes 802.11 b/g/n and Bluetooth 4.0. 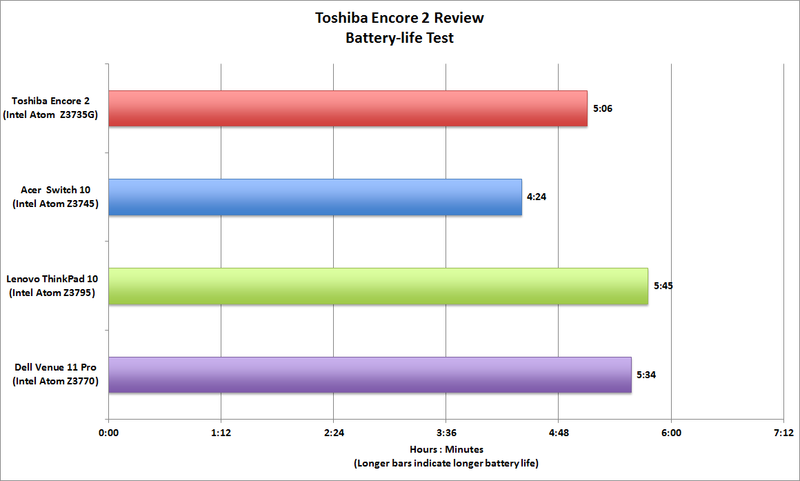 Toshiba moved the Encore 2's Start button to its top edge, alongside a volume rocker and power switch. The Encore 2 is powered by Intel’s quad-core Atom Z3735G (a Bay Trail-class processor), but having just 1GB of memory—not upgradable—leaves me a just a wee bit nervous. When’s the last time you ran Windows on anything with that little RAM? Having said that, this tablet runs Office 365 without a problem (Toshiba includes a one-year subscription with the purchase price). In fact, the performance hit as a whole isn’t as significant as I had expected. The Encore 2 turned in lower benchmark scores than other Windows tablets we've tested, but they weren’t drastically lower. 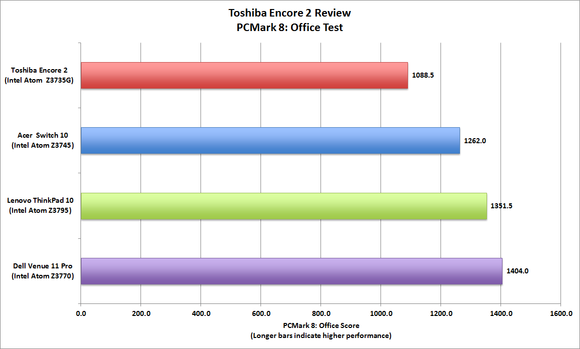 While its PCMark 8: Office score was 22 percent lower than that of the $430 Dell Venue Pro 11, it was just 14 percent lower than the $569 Lenovo ThinkPad 10's. 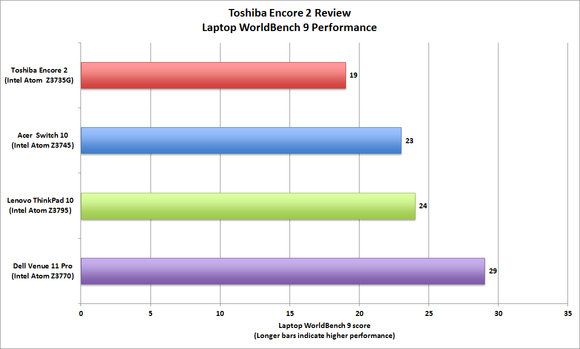 Yes, the Toshiba Encore 2 trails the field in terms of its Laptop WorldBench 9 performance. 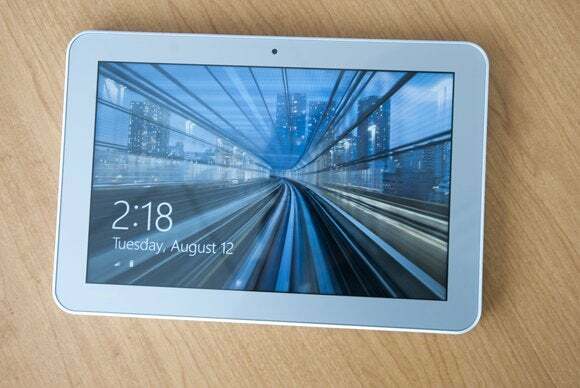 But it's also the least-expensive 10.1-inch Windows tablet we've tested. In fact, I used the Encore 2 and a Bluetooth keyboard to write this entire review in OneNote without encountering any significant slowdowns. I also used it as I would every other tablet I’ve reviewed: I read and wrote email, surfed the web using multiple tabs, streamed Netflix movies, and noodled around small-footprint modern UI apps. The only difference I noticed is that apps clear out of memory more quickly. That just means apps must refresh if they fall more than four or five places down the queue in the sidebar app switcher. The Encore 2's performance won't set the world afire, but it's strong enough for light productivity tasks. Toshiba made a number of compromises to hit this low price point, but the Encore 2 runs Windows 8.1 and Office 365 well enough for us to recommend it.